Acknowledged author Jesse Dukeminier wrote Property (Aspen Casebook) comprising 1200 pages back in 2017. Textbook and etextbook are published under ISBN 1454881992 and 9781454881995. 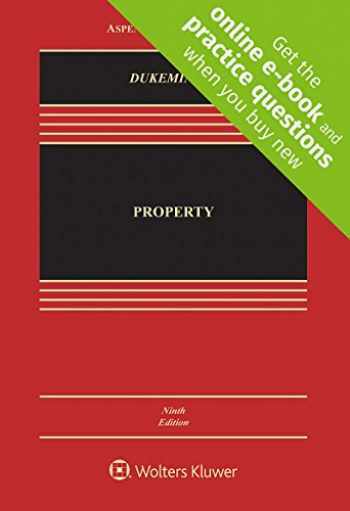 Since then Property (Aspen Casebook) textbook received total rating of 4 stars and was available to sell back to BooksRun online for the top buyback price of $101.19 or rent at the marketplace. Buy a new version of this Connected Casebook and receive access to the online e-book, practice questions from your favorite study aids, and an outline tool on CasebookConnect, the all in one learning solution for law school students. CasebookConnect offers you what you need most to be successful in your law school classes portability, meaningful feedback, and greater efficiency.Jesse Dukeminier s trademark wit, passion, and human interest perspective has made Property, now in its Ninth Edition, one of the best and best loved casebooks of all time. A unique blend of authority and good humor, you ll find a rich visual design, compelling cases, and timely coverage of contemporary issues. In the Ninth Edition, the authors have created a thoughtful and thorough revision, true to the spirit of the classic Property text. Key Benefits: A new chapter on the Intellectual Property/Property relationship, that gives students a taste of patent law, copyright law, trademark law, and trade secrets law. The chapter highlights the differences and similarities among the legal treatment of real, chattel, and intellectual property. A dynamic, two-color designed casebook that encompasses cases, text, questions, problems, examples and numerous photographs and diagrams. Extended coverage of major recent Supreme Court decisions, including Murr v. Wisconsin, Horne v. Department of Agriculture, and Marvin M. Brandt Revocable Trust v. United States. CasebookConnect features: ONLINE E-BOOK Law school comes with a lot of reading, so access your enhanced e-book anytime, anywhere to keep up with your coursework. Highlight, take notes in the margins, and search the full text to quickly find coverage of legal topics. PRACTICE QUESTIONS Quiz yourself before class and prep for your exam in the Study Center. Practice questions from Examples & Explanations, Emanuel Law Outlines, Emanuel Law in a Flash flashcards, and other best-selling study aid series help you study for exams while tracking your strengths and weaknesses to help optimize your study time. OUTLINE TOOL Most professors will tell you that starting your outline early is key to being successful in your law school classes. The Outline Tool automatically populates your notes and highlights from the e-book into an editable format to accelerate your outline creation and increase study time later in the semester.